Everyone has seen a get rich quick working from home on the internet scheme at some point in their life either on the internet, in magazines and newspapers, or on television. Most people have grown so jaded and cynical because of the endless stream of these kinds of products that theyve completely disregarded even the idea of making money on the internet let alone getting rich from it. The truth is a lot of the time these schemes are just a scam and the only person making money is the person who posted the ad or is selling the product. But there is one avenue where people have been consistently making money for some time now. Some folks have been able to generate so much income from this method that they were able to quit their day job and go into business for themselves. This method is called affiliate marketing. So What Is Affiliate Marketing, And Why Physical Products? Affiliate marketing is actually a fairly simple concept and why it works makes a lot of sense. Basically what happens is large online retailers like https://www.tradebit.com want to boost their sales. In order to do this they offer an affiliate program, which means that if Amazon sells a product on account of your marketing they will pay you a percentage of the value of the product that you helped sell. If you think about some of the products for sale on Amazon you can see how this can become profitable fairly quick. Think about a TV for instance. Most TVs are in the $800-$1000 price range. Amazons compensation program is somewhere between 4-6 for most products, so on a $1000 TV thats between $40 and $60 in your pocket! You dont have to pay sign up for this program, or keep an inventory of products. All you do is create an affiliate website that lists the products and then promote your website through SEO, social bookmarking, web 2.0, and various other methods. If Its That Straight-Forward, Why Isnt Everyone Else Doing It? It can be difficult figuring out where to start in affiliate marketing so thats why we created a 16 part video series that will walk you through each step of affiliate marketing. First off, well show you how to become affiliates with all the top retailers. Next, well teach you how to decide upon a product to promote and isolate the appropriate keywords in order to generate traffic. From there well go step by step through the process of registering a domain name, setting up a host, developing your site, and attaching the links from your affiliate retailers. Once your site is set up we then go through all the most popular methods of optimizing your site to make it search engine friendly. Finally, we go through each of the many ways of promoting your site through blog posts, social bookmarking, web 2.0, press releases, etc. What Will I Achieve In The End? 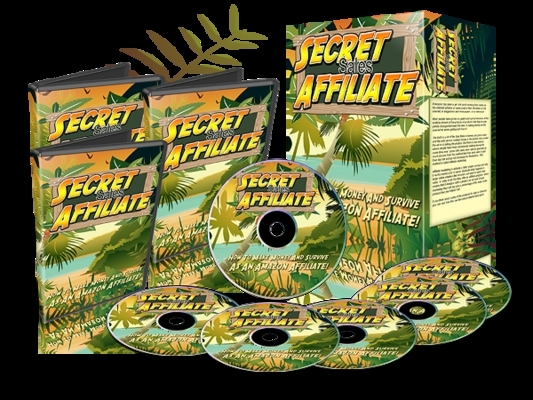 By the end of the video series youll have everything you need to begin affiliate marketing. It can literally be within days that you start generating traffic and in turn sales! The video series is ideal for anyone whos looking to make money on the internet but willing to put in the time and energy to learn. If you follow the steps outlined in the videos theres no reason why you cant start making real money online in a matter of a few days. Like anything in life the amount of money you make will depend solely on your time invested and your motivation to sell products. This isnt a get rich scheme this is a proven system that when followed correctly will lead to the generation of real profit and a dependable source of income. Let me reveal to you whats inside this new video series..
Video #1 - An Introduction To The Amazon Affiliate Program In video one you will learn what affiliate marketing is and how it can be a profitable venture if done correctly. Youll learn the compensation schemes of various top ranked websites as well as how to properly decide upon a product to promote. Video #2 - Get The Right Keywords! Once youve selected a product to promote video two will go into detail on selecting the best keywords to generate a steady flow of traffic to your site. By the end of the video youll understand how to research specific keywords and phrases for any product, which will then be used to boost your rankings on the top search engines. Video #3 - Signing For As An Affiliate! Now that you have your product and your keywords youre ready to become an affiliate. Video three will take you step by step through the process of signing up for Amazon and other companies affiliate marketing programs. Video four will walk you through the process of registering a domain name and show you some crucial tips that will save you time and money by avoiding a registrars up-selling and promotional tactics. Once youve registered a domain name you now need to set up a website host to store your websites data. Video five shows you how to get through this process without the headache as well as provides some great tips that will help choose a reliable host and avoid purchasing unnecessary products. In video six you take your registered domain name from video four and add it to your hosting account that you set up in video five. This can be a difficult step if you lack guidance, but fortunately the video walks you through it in just a few easy steps that make it an accomplishable task for anyone. After youve tied your domain to your host youre ready to develop your site. Videos seven A and B are crucial to developing a website. What youll learn is how to install Wordpress on your site using either Fantastico or Simple Scripts depending on the hosting company you decided to go with. This video lays out this complex process in an easy to understand format that will help you avoid long phone calls with your hosting companies technical support team. Once you have this information setting up Wordpress in the future will be a breeze. Even though your websites beginning to come together youre still not going to rank very high on the search engines. Video eight will explain several different plugins that will help make your site more search engine friendly and better your chances of coming up on the first page of the top search engines. Now that youve optimized your site youre ready to start planning its layout and design. Video nine will teach you how to change your wordpress theme and creating a professional looking site with ease. Video #10 - Grab Your Links! In video ten we start to get to the meat of affiliate marketing. Here were going to learn how to set up the affiliate links on your website so that clients can begin viewing products and you can begin making money. Here youll also learn which links are best suited for an affiliate page to keep it looking professional and ensure anyone who visits your page feels compelled to follow the link and purchase the product. Video #11 - Creating Your Money Post! In video 11 youll be creating your first money post. What this means is that youll be writing your first blog post promoting your chosen product. If done correctly the post will compel people to follow the link to your affiliate site and in turn generate a sale, which will put money in your pocket. Video #12 - Tagging And Bookmarking For TRAFFIC! In order to promote your offer you have to let people know that youre around. In video twelve youll learn about a concept called social bookmarking, which basically is a way of interacting and telling other sites that youre here and youre offering a product. This can be tough to understand but the video does a great job of putting the process in laymans terms and shows you how to put it into action without any trouble. This is a crucial step in promoting any website as it will generate back links and help you get indexed on all the top search engines. Video #13 - Writing A Press Release For TRAFFIC! Another great promotional strategy that is a must in todays competitive market is the use of press releases. Video thirteen explains what a press release is, how it will help you, and how to go about creating one and posting it to the web for people to see and follow to your website. Video #14 - More TRAFFIC With Web 2.0 Properties! In video fourteen youll learn another promotional strategy which utilizes a concept called web 2.0 properties. Basically what youll do is set up posts on various second generation websites that will increase your back links and help generate a larger traffic volume to your website. Without this kind of targeted traffic flow your website would be completely unknown to the world. Video #15 - Creating Videos For More TRAFFIC! In todays day and age you have to use everything at your disposal to attract customers to your website. In video fifteen youll learn how to utilize the power of video to drive traffic to your site. Youll learn how to utilize software on your computer to create and edit a promotional video and then learn how to upload the video to various social media sites for the world to see. Video #16 - Extra Promotional Avenues! Video sixteen will provide you with a few more tidbits before you head down the affiliate marketing path including some more promotional avenues, as well as some more suggestions of affiliate programs that have huge payouts.